Hotel is within walking distance to over 100 restaurants, nightlife & local attractions including San Jose Museum of Art and Tech Museum. Connected to the San Jose Convention Center, our recently redesigned San Jose Marriott offers travelers an inspired downtown location. Check into your modern hotel room or suite and enjoy generous layouts, plush bedding, mini-refrigerators, ergonomic workstations and exceptionally fast Wi-Fi. Many rooms offer city views. Upgrade to a suite or Concierge-level room to access our rooftop lounge and perks like complimentary breakfasts. Two high-tech conference suites with adjacent sleeping spaces are also available. In fact, more than 21,000 square feet of cutting-edge meeting and event space is for hire. Guests are invited to take advantage of our delicious restaurant options, including a popular steakhouse helmed by celebrity chef Michael Mina and an eclectic lounge. The property also boasts a rooftop pool, whirlpool and fitness center. In addition to the adjacent Convention Center, guests of our pet-friendly California hotel are minutes from events at San Jose State University and the SAP Center. You may cancel your reservation without a fee 2 days before your arrival date. Mineta San Jose International Airport is only 3.5 miles to hotel and about $20.00 one way in taxi. The San Jose Marriott Hotel only offers valet parking services. Cost per vehicle is $22.00 upon parking up to 2 hours, $22.00 from 2-5 hours, with a maximum charge of $39.00 per day. Oversized vehicles are $45 per night. Cost is subject to change without notice. Public parking can also be found at $20.00 a day without in-and-out privileges the San Jose Convention Center which is directly connected to the San Jose Marriott Hotel. 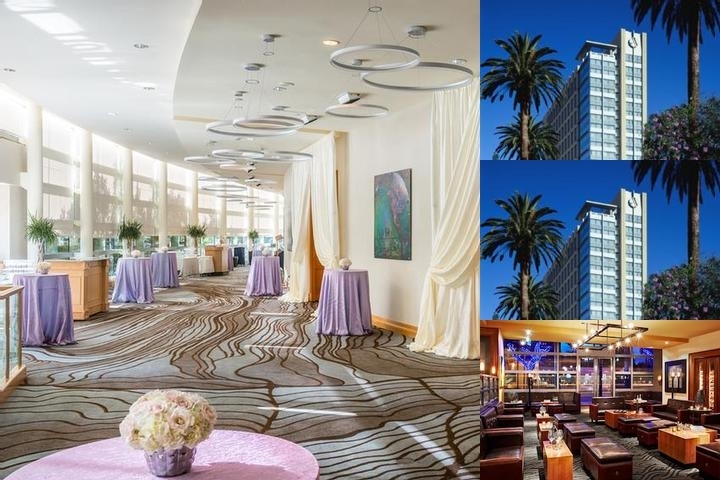 Below are the meeting, banquet, conference and event spaces at San Jose Marriott. Feel free to use the San Jose Marriott meeting space capacities chart below to help in your event planning. Hotel Planner specializes in San Jose event planning for sleeping rooms and meeting space for corporate events, weddings, parties, conventions, negotiated rates and trade shows. 23 x 20 x 15 Ft.
27 x 21 x 11 Ft.
165 x 55 x 15 Ft.
30 x 32 x 15 Ft.
32 x 23 x 9 Ft.
18 x 28 x 14 Ft.
31 x 22 x 11 Ft.
26 x 23 x 9 Ft.
32 x 70 x 15 Ft.
78 x 23 x 9 Ft.
14 x 16 x 9 Ft.
79 x 21 x 11 Ft.
33 x 32 x 15 Ft.
35 x 33 x 15 Ft.
18 x 10 x 8 Ft.
25 x 21 x 11 Ft.
33 x 70 x 15 Ft.